I love the Los Angeles mobile food scene. Sure, the food can be hit or miss and the lines can be alarming, but I’m a sucker for entrepreneurial ventures, especially of the edible variety. The only beef I have with the movement is its extreme bias toward The Westside of the city. Those of us who dwell east of the 5 must hoof it across town to partake in the fun or resign ourselves to weeping over our Twitter feeds. I’d willingly give up the Rose Parade in exchange for some meals-on-wheels affection! On the second Thursday of every month, something downright magical happens—all of the city’s gourmet roach coaches roll into downtown Los Angeles for the Art Walk. Downtown isn’t exactly Pasadena, but it is definitely closer to home than Venice, so I’ll take what I can get. The first truck that The Astronomer and I visited on a recent Art Walk venture was Lomo Arigato. 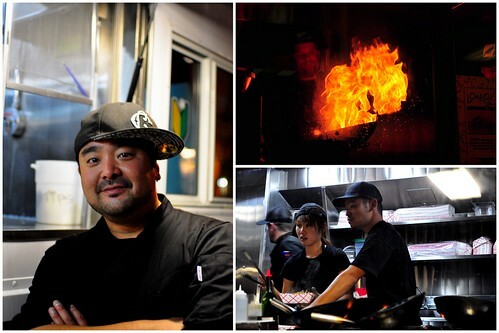 Eric Nakata, the truck’s chef and owner, dishes out Peruvian cuisine with a Japanese flare. According the Chef Nakata, the food is Peruvian while the spicing is Japanese (i.e. Kikkoman soy sauce). The name of the truck is a combination of its signature dish—lomo saltado, and the Japanese word for ‘thank you very much’—domo arigato. What’s special about the Lomo Arigato truck is its “open kitchen.” While waiting for our food to be prepared, we were entertained by a pyrotechnic display. 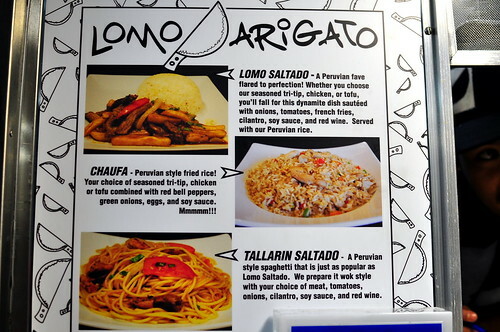 Lomo Arigato’s menu is only three items long—lomo saltado, chaufa (Peruvian-style fried rice), and tallarin saltado (Peruvian-style spaghetti). Each dish was priced at $7. The Astronomer and I went with Chef Nakata’s suggestion and ordered the signature lomo saltado, which was comprised of tri-tip steak, onions, tomatoes, cilantro, and french fries sauteed in red wine and soy sauce, and served over white rice. Aji sauce, also known on the truck as “the green sauce,” was served on the side. The generously portioned lomo saltado was seasoned simply and well. The aji sauce stood out as the star of Lomo Arigato show. 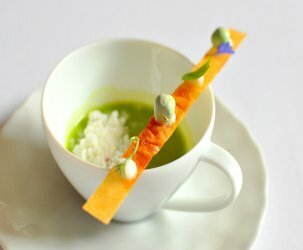 Its complex spiciness and addicting creaminess kicked all of the ingredients up several notches. Our only complaint with the lomo saltado was that the onions weren’t cooked well enough. A gentle caramelization would’ve made the entire dish a lot more appealing. Next time around, I’ll specifically request for the onions to be well done. Follow Lomo Arigato on Twitter @lomoarigato. Mmm. This looks promising! 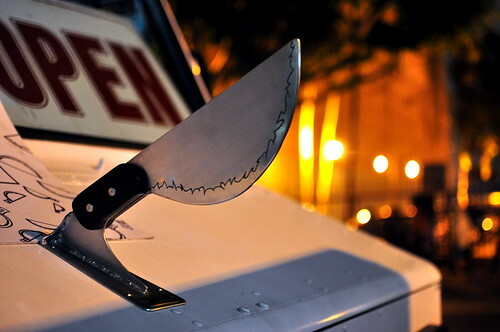 Love your scary knife pic! This is bloody awesome!! !You know, less overhead do deal with considering the exploding real estate prices in California. I’d own one of these and park it right in front of a night club. Get the drunk and sloppy patrons fed well. Eric and his crew are turning out some of the best mobile kitchen food I’ve had yet. Good to see him written up here. If you folks have him around you, you really should try it out. Love Lomo Arigato. 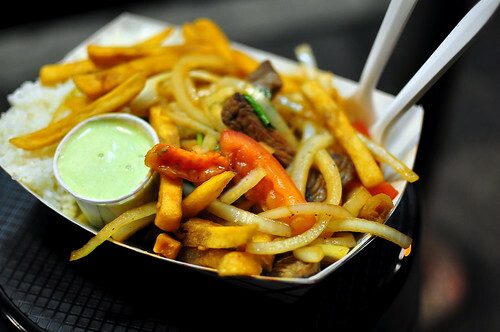 The Saltado dish is on par with other Peruvian restaurants in L.A. and the price is very competitive. The green sauce doesn’t have the same bite as at most restaurants, but it tastes fantastic the next day spread on toast. It is definitely in my truck rotation along with Koji and Nom Nom. Lunch in L.A. has definitely taken a turn for the delicious lately! I really love their food. If you’re a bit out of the way its well worth the drive. what cool visuals – love the pyrotechnics and funky blade welded onto the truck. mmm, fries in a stir fry! Ooh want a piece of this asap! Love the fact that they’ve just got 3 items on their entire menu. 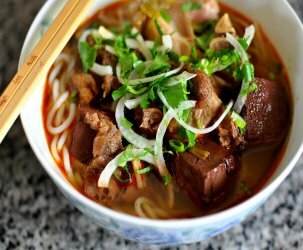 I’ve got the tallarin saltado in my sights. That… just… yum. And Japanese/Peruvian? Think they’ll drive their truck over here where I can get at it? Talk about International…..the dishes presented are “Chifa” dishes, basically Chinese-Peruvian, though I didn’t see a Japanese flair, they looked liked they were done very well. Now, if he had a good tiradito……. 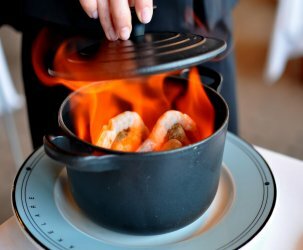 hi gastronomer but you are tottally wrong about the under cooking onions ….the onions gives the crunchiness and healthiness. that’s it.